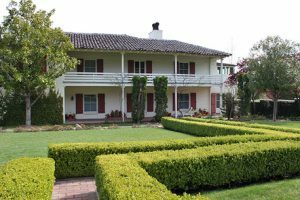 I visited Eugene O’Neill’s home, Tao House, in Danville, California, where he lived from 1937 to 1943. It is now a national historic site that thousands of visitors flock to every year. It is a special feeling to step inside the home where he wrote his most personal and successful plays, including The Iceman Cometh, Long Day’s Journey Into Night and A Moon For The Misbegotten. He did this even though he was in poor health; he had Parkinson’s disease, which resulted in a severe hand tremor that greatly affected his writing. It was odd that he chose to move to California in 1937 because for most of his life he was a drifter in New York City and in the New England area. By moving to Danville, it was apparent that he wanted to isolate himself from the world. He shared the home with his third wife, Carlotta, who fiercely protected him. She provided Eugene with a rare stable home life from which to work and write. She thwarted any visitors so as not to disturb her husband’s work. Carlotta also oversaw the design of their home, Tao House. They built their dream home from O’Neill’s Nobel Prize for Literature award money, amounting to $40,000. In her design, Carlotta made sure that there were no guest rooms. I remember seeing a single bed in one of the foyers. She wanted to make it as uncomfortable a night as possible for any of his friends and family who may have decided to pay a visit. On the second floor is his work study. 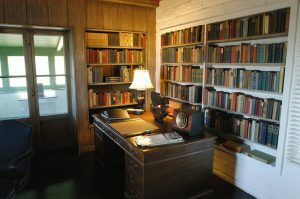 It is wood-paneled and designed to look like a ship’s cabin, reflecting Eugene’s deep connection to the sea. Gazing out the study window, one can see the old white barn that looks just like the set O’Neill describes in A Moon for the Misbegotten. Tao House is where Eugene O’Neill began his journey into writing about his painful past and unleashed the ghosts that had forever haunted him. He tragically lost his family in the four years between 1922-1926. He then felt free to write about them. He had a tumultuous relationship with his overbearing father, James O’Neill; his drug-addicted mother, Ella; and his alcoholic older brother, James, Jr. Perhaps the most damaged family member was his oldest brother. James, Jr. was bitterly jealous and angry over Eugene’s success, and throughout his life he suffered from severe depression and alcoholism. After his father died, Ella blossomed as a widow, and James, Jr. even quit drinking for a few years. They were both clean and sober and became great traveling companions. When Ella died in Los Angeles, James, Jr. brought his mother’s body back home on the train. He then sank into depression once again and eventually drank himself to death. 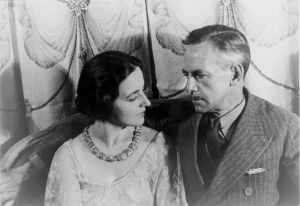 In his dedication of Long Day’s Journey Into Night, Eugene wrote to his wife Carlotta, “I give you the original script of this play of old sorrow, written in tears and blood…I mean it as a tribute to your love and tenderness which gave me the faith in love that enabled me to face my dead at last and write this play – write it with deep pity and understanding and forgiveness for all the four haunted Tyrones.” Like A Moon for The Misbegotten, it is a love story without a happy ending. Eugene was born in a hotel room and spent much of his youth living in different hotels when his father was on tour. He had always hated living like that, but he carried it over to his adult life, wandering from place to place like a lost nomad. His first real home was Tao House, where he lived for six productive years. Besides writing his masterpieces, he also wrote A Touch of the Poet and More Stately Mansions. These were part of a planned eleven-play cycle about his Irish family in the 1800’s. Eugene O’Neill’s A Moon for the Misbegotten is being presented by the Kansas City Actors Theatre now through September 30th at the City Stage in Union Station. Tickets in information are available at www.kcactors.org or by calling the Central Ticket Office at 816-235-6222.